Fox Valley Coins, one of the premier outlets in the country for rare coins, antiques and collectibles, will be sponsoring Proxiblog this week and other weeks in the year, thanks to a generous donation to our scholarship fund. We get that in the Heartland. We also appreciate Marlon’s work ethic and exemplary staff. You can read about Marlon and his shops in three Illinois locations by clicking here. Whenever Fox Valley Coin schedules a Proxibid auction, we get excited, because we often find top consignments that cross over to PCGS and please our own clients. See for yourself! Click here to view the company’s Saturday, Sept. 14, Proxibid catalog. 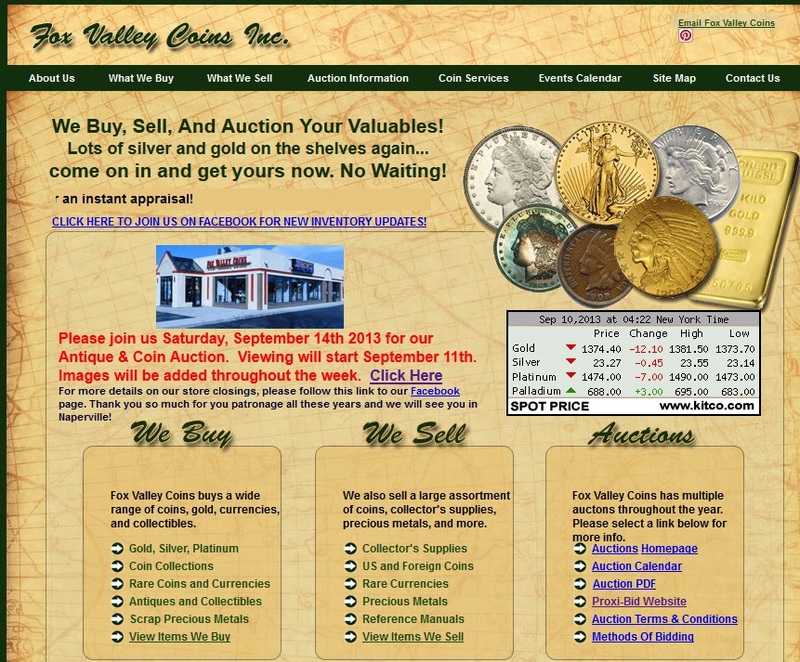 Fox Valley Coins pays top dollar prices – especially for rare coins and currencies. If you have a consignment, you might want to tell Marlon about it by visiting this page, which shares contact data for his stores and offers an online contact form for your convenience. We thank Marlon Mathre and his companies for underwriting our scholarship fund. We provide Proxiblog for free, sharing news about Proxibid and best practices for auctioneers and bidders. Recently, our viewership tallied more than 40,000 page views on the day that we filed our 500th post! This entry was posted in The Block, Uncategorized. Bookmark the permalink.